Hello and Happy Tuesday! 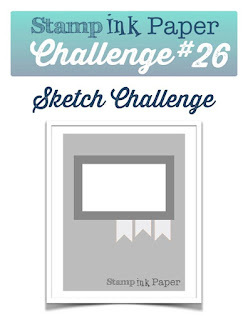 It's time for another SIP challenge and this week we have a fun sketch for you! I really LOVE sketch challenges! I usually get a feel for the stamp set I want to use the first time I look at the sketch. Do you do that??? This week's sketch gave me a nautical feel so I went to my "go to" stamp set, Traveler! On this one I started with an A2 card base of Night of Navy. My rectangle mat was Real Red that measured 3 1/2" x 2 1/2". I stamped the World Map stamp set on Whisper White Cardstock and cut that 3 1/4" x 2 1/4" and adhered to the red layer. My banners were cut with my banner punch out of last year's Nautical DSP.. I may be hoarding it....lol The ship was stamped in Night of Navy onto Whisper White and fussy cut and attached with dimensionals onto the left side of the rectangle. My "thanks" die cut was a thank you gift that I received with my first order from Taylored Expressions. It's the first time that I've used it and I LOVE it! I will definitely use it again!